Sleeping is one of the most vital parts of any adventure or activity that spans over multiple days, and without sleep, we simply would not survive. You’ll agree with us that when you are out in the wild, a lack of sleep can lead to an unproductive or possibly dangerous day. Many backpackers find that sleeping in sleeping bags or on mats can be quite uncomfortable. Fortunately with the best camping cot, you won’t have to compromise comfort when sleeping in the camp. Camping cots offer additional support and comfort when compared to other sleeping areas, and they can prove to be an incredibly worthwhile investment. 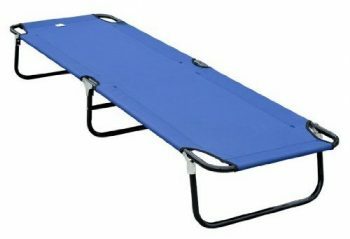 With camping cots, you’ll be elevated off of the ground so you won’t have to worry about creepy crawlies climbing over you while you sleep. Camping cots also provide a great place for you to relax in so you can enjoy the nature around you to the fullest. Choosing the best sleeping cot can be an overwhelming task, but worry not, because we are here to help! In this article, we will provide an overview of the things you need to take into consideration before you decide which camping cot to purchase. Once you get a general idea on how to choose the best cot for you, we’ll recommend some top rated products that should be worth your time and money. Let’s take a look! One of the first things that you should consider is whether the camping cot that you are looking to purchase is suitable for your height. It really is a make or break design feature. Taller people often struggle when it comes to finding a suitable camping cot, although there are some longer options that are suitable for people of around 6’6”. You have to be aware of how large the camping cot is when it is erected, as you need to make sure that it fits in your desired sleeping space. This is incredibly important, especially if you plan on using a camping cot with a bunk function. The last thing you need is someone’s head hitting the ceiling! The majority of camping cots that are readily available on the market are at least 10 inches off of the ground, and you can use that additional space to your advantage. Another make or break feature of a camping cot is whether it has the ability to support your weight or the weight of the person using it. The majority of camping cots that are available on the market can support 300 – 600 pounds. This can vary on a model by model basis. You should take extra care and be cautious if you plan on using a double travel cot for two people. One of the few disadvantages that you will find while researching camping cots is the fact that the majority of them are not easy to carry around. Many of the ones that are not suitable for long hikes will actually slow your adventure down, and there are only a few on the market that could really be considered portable. The weight of a camping cot is an important thing for anyone that is considering manually moving their cot, hikers for example. If it does weigh too much then it is going to be hard to carry and move around, so you need it to be as light as possible. 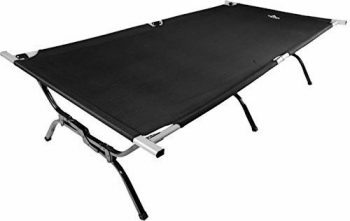 The one downfall to a lighter camping cot is that heavier options are usually much more durable. You also need to be aware of the dimensions of the camping cot whilst it is folded away, to make sure that it is portable in the way that you need it to be. For example, if you plan on moving your camping cot with your car then you need to make sure that it fits in the car! Another thing that you should consider when purchasing your first camping cot is the material that the surface is made out of. This is a vital thing to consider as the wrong material can lead to a very uncomfortable sleep. Ideally, you should look for a material that is sturdy, and that will not leave a valley underneath you over time. The durability of a camping cot is highly important due to the impact that it can have on your own health and safety. You should also make sure that the material is breathable so that you do not get too warm on top of it during a summer night. In general, a travel cot has the ability to keep you cooler than the average sleeping bag can. Camping cots are actually suitable for a variety of different uses, and almost everyone could find a use for a cot within their own lives. Even people that do not like adventures could find that a travel cot is ideal for use when you have an unexpected houseguest, especially if you do not want that houseguest to have to sleep on your sofa! Camping cots are more suitable for camping when you are using a static camping location so that you do not have to change your location too often. Otherwise, you may find your camping cot too difficult to carry around with you, and they are often quite bulky. Many adventurous travelers use their camping cots at base camp. While travelers that enjoy using hotels might find that, they have a child that would benefit from a camping cot so that they don’t have to sleep in a make shift bed. Children will find it easy to use travel cots, as they are easy to climb. They also keep you away from the ground, and the insects that might be lurking down there! How easy a camping cot is to assemble might not be something that you initially think about, but you should. The last thing that you want is to be stuck in your tent with several different pieces of your bed scattered across the floor, with no obvious fittings and fixtures. An ideal cot can be assembled within minutes. It would be highly advisable to have a trial run while you are still at home so that you know whether it will be easy or difficult while you don’t have to worry about it too much! Considering the aforementioned features, we have sifted through most camping cots in the market and have made a comprehensive shortlist. If you are looking for a camping cot that would be suitable for use by two people, two children for example, then look no further. Disc-O-Bed Cam-O-Bunk Cot is literally a bunk bed, and it has the ability to carry two different people of up to 500 pounds. It can do that safely, as it features incredibly strong, rust resistant steel legs. Both of the actual bed spaces include two separate side organizers, and these can be used to store a variety of personal belongings. We believe that these are an absolute necessity for any belongings that could be broken if they were left out on the ground, the last thing you want to go home with is a shattered smartphone screen! For additional ease of use, this particular travel cot has been designed so that it can be taken apart, that way you can throw the fabric into the washing machine opposed to just wiping it down! This camping cot is very versatile and can be used for all kinds of purposes – even as an additional bed in your house for when you plan to host guests. If there’s one caveat, it’s the smell. Unfortunately, this cot is quite strong-smelling – perhaps because of the polyester fabric. Related: This cot is designed to hold up to two people, and it should be able to do so safely as long as the occupants are within a reasonable weight range. 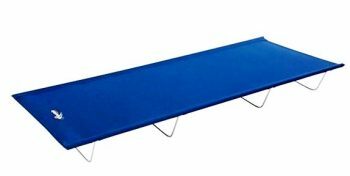 On the other hand, if the occupants are quite heavy and you’re not sure about whether this cot would be able to hold up or not, support it with this Disc-O-Bed Non-Slip Foot Pads. One thing that a lot of campers don’t like about their camping cots is that they have to set them up inside tents, so why not skip a step? The Kamp-Rite Oversize Tent Cot literally comes with a tent attached to it, and the tent material is highly waterproof. The actual tent also features a rain fly that has been specifically designed to handle tough weather conditions. An additional feature of this particular camping cot is that it is both versatile and durable. It is versatile because it can be used as either a lounge, chair, or a flat cot. While the durability that it offers is quite unique. It features a cot frame that is made out of aluminum, so it is lightweight. While the majority of the lightweight camping cots on the market are not durable, this particular model is renowned for being incredibly sturdy. You might think that a tent with this kind of complicated design would be very difficult to set up, but that’s not the case. You can pitch this cot within minutes once you’re used to it. If there’s any caveat worth mentioning, it’s that the rain fly isn’t big enough so you might still get splattered with raindrops. But as cots, in general, don’t come with a rain fly, this one is good enough already as far as extras go. Related: You’ll have to purchase the Kamp Rite Gear Storage Bag for this tent separately. Technically, it’s okay if you want to use your own spare storage bag, but as this cot is quite uniquely designed, it might not fit well in any other bags that aren’t specifically designed for it. 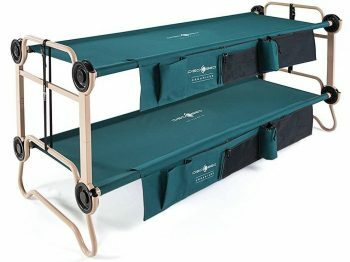 Comfort is one of the key things that camping cots are known to provide campers, and the Coleman ComfortSmart Cot is an excellent example of just how comfortable they can get. It features an incredibly thick foam mattress, with a spring coil suspension insert. This means that the mattress has the perfect balance between being too soft, and too hard. A lot of consumers with joint problems have found that it offers them the right amount of support. 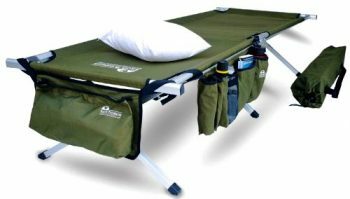 It is also one of the few camping cots that we would advise people to hike with, as it can be folded up into an incredibly compact size. At a weight of just 8 pounds, it won’t weigh you down as much as the majority of cots. So, if you are looking for a comfortable place to sleep after a full day of exploration, this particular model could be ideal for you. This camping cot isn’t particularly unique in design, but that isn’t a minus so much as a plus because setting this one up is a very simple affair. It can be done within minutes. Unfortunately, there seems to be a minor design flaw where most of the weight is concentrated around the middle brace, so that part is particularly prone to breaking. Related: If you plan to hike or camp during the summer when it’s really hot outside, you’ll definitely find this Image LED Camping Lantern with Ceiling Fan a worthy purchase. It acts both as a lamp and as a fan, so you’ll be killing two birds with one stone. If you are looking for a portable and yet durable camping cot, then the Mountain Trails Base Camp Cot could have your name written all over it. It actually comes with a carry bag that it can be stored in, and the carry bag isn’t bulky while in use. Once you take it out of the carry bag you can actually assemble it within just minutes. An additional benefit that you will get out of this particular camping cot is the lightweight durability, as most lightweight camping cots are quite flimsy. This particular model has a powder coated steel frame that is known to last without getting rusty or damaged. The 600D polyester sleeping surface feels sufficiently comfortable to sleep on—although perhaps not the most comfortable—and the aluminum side railings provide a sense of safety so you wouldn’t need to worry about rolling off of the cot while you’re asleep. Design wise, this cot isn’t anything special. Basically, it’s a cot that prioritizes functionality over comfort or extra features. For short term camping or hiking trips, this cot is perfect, but when it comes to long distance trips, you might want to look for something a bit more comfortable. 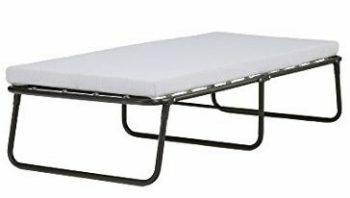 Related: If you plan to take a quick hike or if you just want a short camping session with your loved ones before the summer ends, this cot will work perfectly. For such trips, don’t forget to take this Monoprice 16AWG Power Extension Cord Cable with you also so you can still plug in while you’re at the campsite. As we have mentioned in our article, it can be extremely hard for taller people to find high quality camping cots. Luckily the Coleman Pack-Away Cot has filled that section of the market, as it has a length that is suitable for people with heights of up to 6’6”. It also has the capacity to carry up to 300 pounds. Although it has been successfully used by people who have heavier weights than that, we believe that you should always follow the guidelines that are set by the manufacturer. One feature that a lot of campers could find useful is the fact that this camping cot also comes with a removable side table. The side table features a cup holder, and it has some additional space that would be suitable for a magazine or a map. 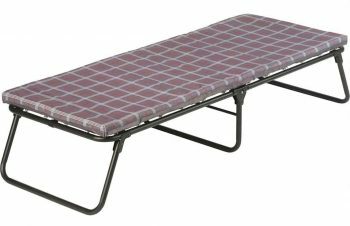 It’s difficult to find a camping cot that’s this sturdy and easy to set up to boot. Despite the large sleeping surface when unfolded, it packs quite small so it would be able to fit inside a car, too. There aren’t many downsides to note—except maybe that the polyester fabric could’ve been made a bit thicker and more comfortable. Related: If you plan to take this cot camping when it’s cold out, you’ll need to a sleeping bag to complement it. This Abco Tech Envelope Sleeping Bag is a perfect choice because it also fits tall people. We understand that there are a lot of people out there that want to flee as soon as they read the words, ‘assembly required’. It is completely understandable, as some products that come requiring assembly are almost impossible to assemble correctly without the help of an expert, or the internet. This Trademark Innovations Folding Camping Cot is rather special, as it does not need to be assembled! All you have to do is unfold it, and you can go straight to sleep. Trademark Innovations are known for producing high quality, lightweight products, and this particular product is no exception. It is easy to move around whilst hiking, and it is perfect for use in the great outdoors. You might think that a product that requires no assembly would be shoddily constructed, but that’s not the case with this one at all. It is quite sturdy. You can even go over the 260 pounds weight bearing capacity a bit and it would still hold strong—although it’s best if you don’t test it. Unfortunately, all products come with downsides and this one is no exception. It smells quite strongly, especially when it’s brand new. Also, you might want to treat it with care because although it’s durable, the interconnected system means that if one part gives out, the rest wouldn’t be able to hold on either. Related: If you’re traveling with children, you should purchase this Regalo My Cot Portable Toddler Bed for them. Technically, Trademark Innovations’ cot works for children too, but it would be best if you could save it for the adults as per the designated use. Let the children have their own fun sleeping space. 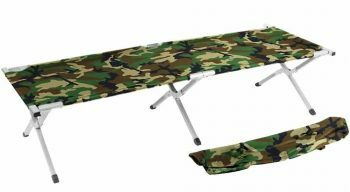 One of the best camping cots that you can find on the market is actually the Outsunny Military-Style Camping Cot, for numerous reasons. One of the most important reasons is the fact that it has been made to be durable, and it is known for lasting incredibly long time periods before succumbing to wear. That is why it is often found in shelters, where camping cots are needed on a regular basis. That durability comes from the high quality steel frame. You’d expect steel to be heavy, but that’s not the case with this cot. It’s quite lightweight, which is why we listed it as one of the few cots on this list that are suitable for hiking trips. The 600 x 300D Oxford cloth provides quite the comfortable sleeping surface. This type of cloth is machine washable, so it is very easy to clean. It is also very easy to set up. The cot’s ingenious design makes it possible to set it up within minutes. This particular model is ideal for use by either adults or children, although children would struggle to carry it over distances on their own. One caveat to note is that you may have some trouble locking the legs. You might want to support them with something if you plan to place a really heavy burden upon it. Related: Be it for a hiking trip or a camping trip, an outdoor adventure with friends would not be complete without a cold drink. Nothing beats that after a good, long day of grueling physical exercise. That’s why you should purchase this YETI Hopper TWO Portable Cooler alongside the cot. Many people that purchase camping cots want them to be suitable for a variety of uses. Others use their camping cot whilst camping will also use it when they go to hotels if they have children. This is because the ultra comfortable design of Simmons Foldaway Bed Cot has the ability to lull almost anyone to sleep with ease, as it features a honeycomb cover. The actual honeycomb cover is easy to maintain, as you can simply remove it from the camping cot and wash it. The comfort level that this cot offers is cranked up a notch by the contoured sleep surface. The memory foam bed would follow the shape of your body. It promises the best sleeping experience even if you plan to use it in the wilderness. Your time will never be unnecessarily consumed with this travel cot, as it can easily be assembled within minutes. You can simply fold it up afterward. Unfortunately, this bed is quite heavy, so it’s really not all that suitable for hiking. It’s reasonably good for car camping, but the place where it truly belongs is in your house or in holiday hotels. Related: For extra comfort, don’t forget to purchase these Excellent Art Cot Sheets. The satiny feel of these high quality sheets as they slide against your skin will make your sleeping experience on the Simmons Foldaway Bed Cot one of the best—perhaps even beating what your own bed at home can provide. 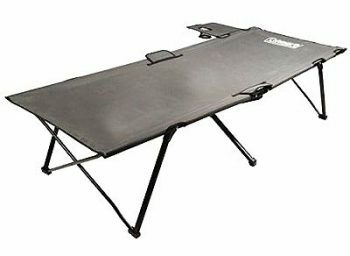 If you are looking for a portable camping cot that could be used in an emergency situation, then the Earth Products Jamboree Folding Cot could be exactly what you are imagining. It is currently used in a wide range of emergency shelters, and out in the backcountry. This is more than likely because of how durable the product is, as the legs have been reinforced with steel pipe inserts. These inserts alone directly affect the longevity of the product. Add the tough anodized reinforced aluminum frame to that, and you’ll have yourself one very durable cot. Campers, scouts, and explorers commonly use this particular model. As well as the occasional unexpected house guest. It is very easy to unfold this cot. Those that have done it several times before can finish it in under two minutes. It is strong, and yet comfortable. Light, and yet durable. It offers the average camper absolutely everything that they would need to get out of their cot. This cot is also perfect for regular home use because of the easily washable fabric. As this is a cot designed for use during emergency situations, the manufacturer certainly didn’t put comfort ahead of functionality. The sleeping surface is quite tough and uncomfortable. On top of that, the frame squeaks when you move around on it so it can bother the other campers if there are any. Related: Although this cot isn’t the most comfortable one, this shouldn’t be a deal breaker as it is quite easy to fix. All you have to do is put this Texsport Dual-Foam Sleeping Mat and voila! You’ve got yourself a top notch sleeping space. Versatility is key with a lot of camping products, and luckily cots are no exception. 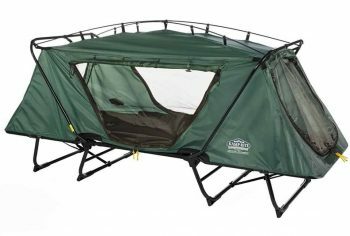 The TETON Sports Outfitter Cot can be used in a wide variety of situations, as it features a heavy duty 600D polyester canvas material. This material is known for being durable, and what makes it even better is the fact that this camping cot has the same sleeping area as the average twin sized mattress. The other two factors that add to the overall amazing durability of this cot are the patented steel S legs and the aluminum frame. This cot is pretty much indestructible. As it can support up to 600 pounds in weight, not even the cumulative weight of seven people would be able to make this cot fold. Unfortunately, this bed only has enough space for a maximum of two people. Your imagination is the limit with this one. Whether you want to use it at base camp before climbing a mountain, or within the walls of your own home, you will never have a problem. The overall design of this cot is quite ingenious, but there’s one point that, if fixed by TETON, would finally make this product perfect. If the end bars will lock in place instead of needing to be moved manually, this cot will be all the more amazing. Related: You can purchase this TETON Sports Cot Organizer separately if you’d like to add storage space to the list of upsides that this cot has to offer. And that wraps up our review of some of the top rated camping cots that you can buy. Just like any product that has been designed and made for camping, camping cots do come with their own advantages and disadvantages. One of the main advantages of a good camping cot is the amount of comfort that they can offer to the average camper, and another advantage would be the additional storage space. Sleeping cots are also beneficial for people that currently suffer from joint conditions, or people that are recovering from older injuries. 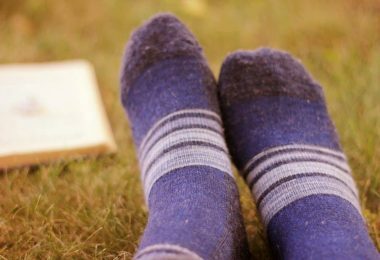 You may also find that by sleeping higher up than you usually would in a tent, off of the ground, you will not be exposed to either the uncomfortable bumps in the mud or the cold that radiates from the ground underneath you. So have you used a camping cot before? How do you like it compared to traditional sleeping bags? Let us know your thoughts in the comments!